Oliver William | write meg! NSVs are those little moments which serve to remind you why you’re pushing so hard and making tough choices every day. They’re related to weight loss, of course, but not directly; as you might guess by the name, they’re triumphs apart from any number on the scale. Fitting back into your favorite pair of jeans, for example. Running your first mile. Making healthy choices at the all-you-can-eat smorgasbord. Buying a smaller size. Foregoing cake for fresh fruit. NSVs come in all shapes and sizes, and each is deeply personal. Though my weight loss has taken a back seat while I struggle to regain my sanity with a 4-month-old, I’ve been thinking about these little accomplishments . . . and how they relate to motherhood. Oliver has his first cold, which started with the sniffles last Friday. My husband called me at work, worried about all the congestion, and we contemplated taking him to the doctor immediately . . . because, you know, the window of opportunity was closing. Everyone knows a kid has to get sick at 5 p.m. on a Friday, right? Just before the weekend — when the shuttered doctor’s offices just taunt you. He didn’t seem too bad, though — and we didn’t want to be alarmists. No fever. No odd behavior. Taking his bottles normally. Laughing and smiling as usual. Just a little stuffy with an occasional cough. As we debated whether Oliver was truly sick or just “not feeling well,” we checked in with his day care provider for guidelines. That was my first Mom-Scale Victory: proactively making that phone call and planning ahead to Monday morning. Because he has had no fever or vomiting, we were cleared to bring him in. But she thanked me for calling her first — you know, just to double-check. And I felt like a mom-boss. 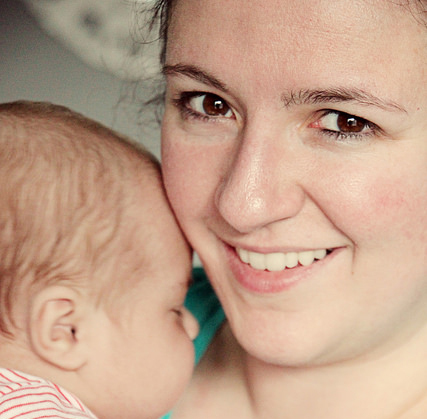 Having a sick baby has definitely been our first introduction to the Working Parent Juggle. And it’s going to be an interesting one. We have a few things going for us: Spencer and I both work locally, a real rarity in the D.C. area; we have friends and family nearby for back-up; we have an understanding day care provider who wants to work with us and help find solutions. Did I want to be home with my sick baby? I did. Especially when I woke up with a sore throat that quickly progressed to my own runny-nose, splitting-head illness that made everything that much more exciting on Monday. I thought getting up with an infant was hard when I was “just” sleep-deprived. Now I’m sleep-deprived, sick as a dog and completely dead on my feet. My mom once told me that some days are just “fighting the war.” She has had a hellish work commute for more than three decades, and she still excelled at raising two daughters with my dad (who worked from home, but also made terrible drives for work). They say you can only truly appreciate your parents when you become an adult — and a parent yourself. While I’d like to hope I acknowledged their sacrifices before now, can I just say: wow. Yes. Getting Ollie to his doctor’s appointment on Monday was another Mom-Scale Victory. I’ve never taken him out in public alone, and I had to ready his stroller and get everything hooked in by myself. While I’ve taken him out in his car seat plenty, I have yet to run errands without Spencer. This isn’t intentional; I just haven’t needed to. But on Monday? It was time. After creating an elaborate plan that included Spence calling the doctor’s office as soon as they opened at 8 a.m. and me consulting my boss for a half-day when I ran in the door, we secured an afternoon sick appointment. I would meet my deadlines by noon and head back to the sitter. I would take Oliver by myself. I was nervous about it, but I didn’t let myself entertain that anxiety. After getting through his prematurity, his NICU stay, those early and tough weeks at home . . . well, I figure it can’t compare to that insanity. This was just wheeling a sleepy baby up to a third-floor doctor’s office alone, you know? Preemie parents feel a special rush of pleasure when others can’t single out our little ones as being early. Oliver was born four months ago today weighing 3 pounds, 9 ounces, and at his appointment on Monday? Our chunky man weighed 15 pounds on the dot. Here’s a Mom-Scale Victory: I didn’t immediately launch into Ollie’s whole story. For months, I took any and every opportunity to talk about our son’s dramatic entrance into the world. “Preeclampsia” was always on my lips, and I found myself wanting to talk about the trauma as a way to . . . relieve it? Comfort myself? Find support? I don’t know. But as spring gave way to summer and summer heads toward fall, my favorite season, I do find myself healing. I have set-backs. I have bad days. I still cry. But all in all? I am getting better. I mean, aside from the cold. That’s going to linger just to torment me. At 4 months old (2 months adjusted), Oliver . . . He is . . . a baby. No longer a newborn, but an infant. A child. One with adorably round cheeks and the cutest little giggle; a baby who loves to grasp our fingers and gleefully watches us move about the room, the center of our little universe. Though I sometimes feel like a heaping mess of a person – a bedraggled wife; a weary mother — I often remind myself of just how far we’ve come. For two glorious nights in a row before he got sick, Oliver slept for six (!) hours. At night. In a row. And he seems to know us. Really know us. Not just as the tall people things with the milk, I think (though there’s that, too) — but as Mama and Daddy. Four months after his birth, my Mom-Scale Victories include never being late to work in the two months I’ve been back at it; finding a way to make the overnight shifts work with Spence; managing to almost finish a book over the course of the last month; and getting more comfortable taking Oliver out with us on day trips. It’s not easy, but it’s worth it — and important. Our duo has had to learn to be a trio, but we’re doing it. In the month to come, we’ll take baby’s first plane ride and head north to introduce Ollie to his New York family. I’m insanely nervous about the flight, only because I’m worried he’ll have a total meltdown — and I’ve been known to get ugly when people stare at me. Or us. But I guess that just comes with the territory, and I’ll have to learn to ignore it. We are, after all, just doing the best we can. And my last Mom-Scale Victory for today? I got this post written on four hours of broken sleep with a head so fuzzy and clogged by illness and medication, it’s really a wonder that I’m upright.